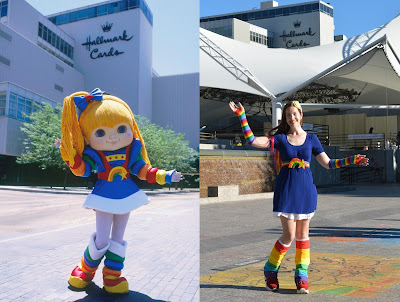 On September 10, 2016, Hallmark held a "Rainbow Brite Day" celebration in their Crown Center store near Hallmark Headquarters in Kansas City, Missouri. 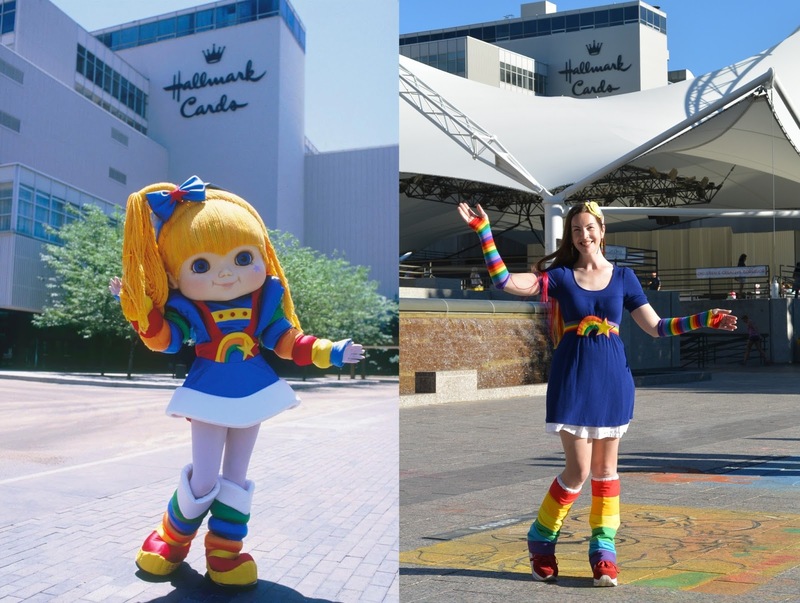 It was a day to celebrate the success Rainbow Brite achieved in the 80s, showcase the individuals and products bringing success to the brand today, and tease fans with promises of items still to come. Employees from Headquarters and the store banded together to make the day spectacular, and let me tell you, it was over the rainbow! Renee Stowe from RainbowBrite.co, our friend Justin (and daughter), and I arrived at the Crown Center mall early to take a peek at what was in store for us that day. 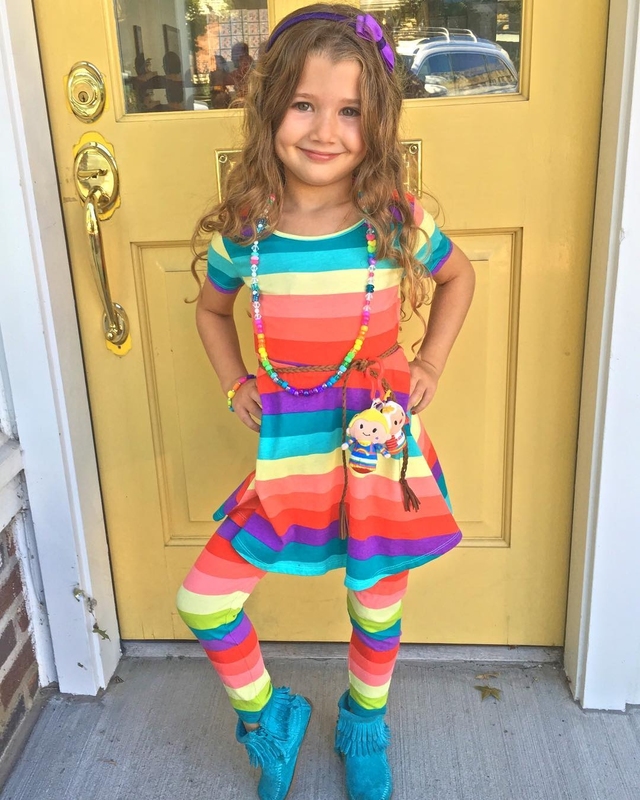 We already knew there would be meet and greets with two original designers (Jeanne Slater and Susie Cozad); book signings by illustrator, Jack Pullan, and writers, Melvina Young and Matt Gowan; a reading by the new voice of Rainbow Brite, Kara Goodier; coloring fun and costume contests. What we did not expect were the decorations, displays and coverage of the event. As soon as we stepped into Crown Center, we were greeted by an enormous rainbow balloon arch. I immediately jumped on the escalators, trying to get a good picture of the magnificent sight. I had come in costume, so a photographer greeted me and asked to take a few shots. I was flattered! And not only had they erected a gigantic rainbow above the store - there were rainbow balloons greeting you at the entrance, along with displays of previously released merchandise, never released merchandise, new merchandise, and original drawings of landscapes and characters from Rainbow Land! Since we had arrived slightly early, I was first in line to get my books, and other memorabilia, signed. The entire team was absolutely lovely. It was easy to tell that they genuinely enjoyed interacting with fans. They giggled at a few vintage Lurky-themed items I had brought for Jeanne to sign, as she was his creator. They were happy to answer questions and surprise us with new information. The writers of the new books were equally gracious, and Kara, the voice of Rainbow Brite in the new interactive books, was one of the sweetest individuals I've ever met. She was definitely the right choice for the job. Hallmark's PopMinded crew was there covering the event, and I thoroughly enjoyed being interviewed by them. Christine and Kevin, being geeks themselves, understood the enthusiasm I hold for Rainbow Brite and how ecstatic I was to be in her birthplace. Peter Martin, who has produced new artwork for Rainbow Brite in recent years and actively works on the brand, had his cell phone at the ready to live-stream as much of the event as he could for out-of-town fans. Hallmark Archivist, Mark Spencer, and Art Director for Characters and Licensed Properties, Brad Springer, could also be seen amongst the happy crowd! The store employees really got into the spirit by dressing in bright colors, wearing Rainbow Brite t-shirts and/or wearing stars and jewels on their cheeks. Not to mention their bright personalities, which could have un-murked even the gloomiest of customers! The activities - coloring, photo-ops, readings, costume contests - were all expertly executed. There were a few adult cosplayers, but the kids really took the cake in the costume department. There were a handful of little Rainbow Brites and a gaggle of the most colorful kids I've ever seen. 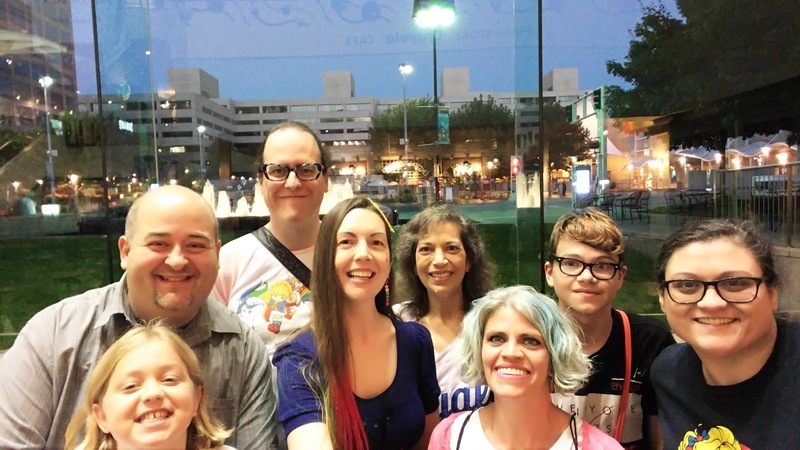 They were clearly having an amazing time, and all of the parents I spoke with were also childhood fans of Rainbow Brite - so they were thrilled to attend as well. As if that weren't enough, we also got a sneak peak at a new doll and a new ornament that will be debuting in stores this fall. I can't tell you how excited I am to know that Hallmark's line of Rainbow Brite merchandise still has a bright future ahead of it! This celebration alone was so amazing that it would have justified my flying from North Carolina last minute to attend it, but the fun didn't end there. 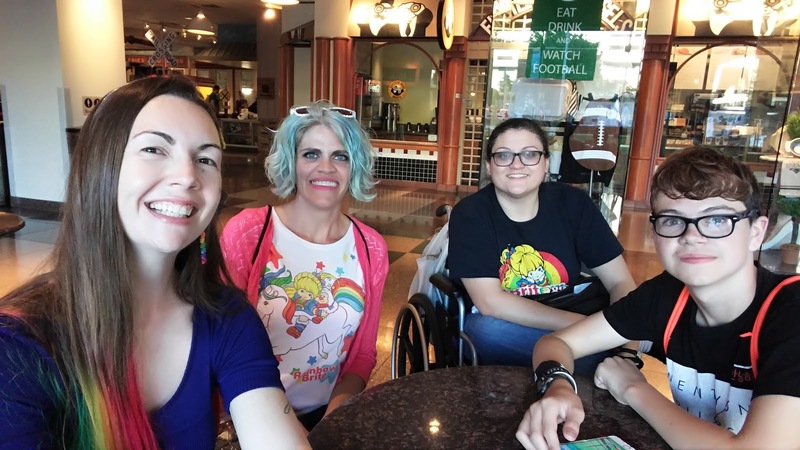 I got to meet several adult Rainbow Brite fans in person who I had previously only known online. 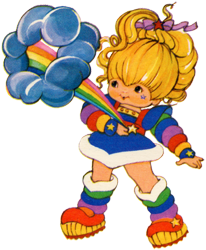 One in particular, Brian, joined my Rainbow Brite mailing list in the year 2000, so I'd known him for more than 15 years! He has always been a valuable part of the fandom, so it was a real treat to give him a hug and express some of that gratitude in person. Another fan, Jane, has been on the Rainbow Brite message boards since at least 2005, if not earlier. It's wonderful to meet people in person whom you've known online for more than a decade! Especially when they are as sweet as Jane!! Jane's fiance, Michael, and another fan, Myra (and son), joined our brigade of Color Kids. And last, but absolutely not least, was our good friend, Justin, who helped make this weekend possible. We made a few purchases in the Hallmark store, had some lunch, tried to recreate the photo of Rainbow Brite standing in front of the Hallmark Cards building, and even spent some time with Anita Marra Rogers, who sculpted the last two Rainbow Brite ornaments! Basically, we were having so much fun that, in the blink of an eye, the mall was closing and it was time to leave. The day felt like a miniature Rainbow Brite convention, which is something Hallmark has never attempted before. It's difficult to put into words how amazing the experience was. I flew in from North Carolina, Renee flew in from Florida, and Jane and Michael drove four hours from St. Louis to be there - and that was only with a week and a half's notice that it was taking place! I'm sure if we had known about the event earlier, even more fans would have made the trip to Rainbow Brite mecca. My hope is that this will become a regular event in Kansas City and across the country in other stores. Perhaps this could even be the beginning of a larger event to come. A girl can dream! I want to extend a huge THANK YOU to everyone who pitched in and made this event a reality. We appreciate your efforts so very much, and you all did an amazing job! I hope to see you again someday. Thanks for the sweet comments!! Nothing has been decided regarding the rest of the Color Kid itty bittys yet, but the current thought is that they'll probably be online exclusives as well, if they are produced.